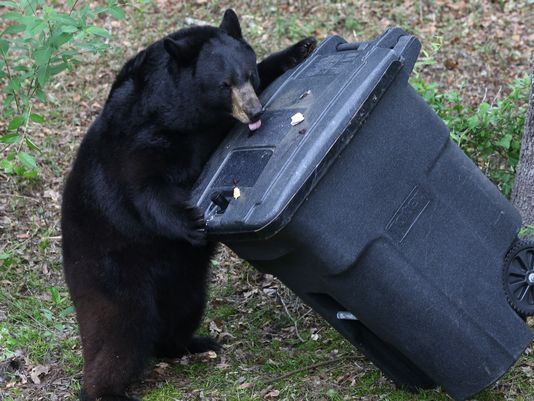 Bears love to find easy meals and unsecured trash is the number one bear-attractor in residential areas. Bears that become food conditioned are more likely to return to neighborhoods and cause property damage to get to the easy food source. Using bear-proof trash cans helps deter bears from associating your home as a food source. The city of Daytona Beach has partnered with the Florida Fish and Wildlife Conservation Commission (FWC) to provide highly discounted, bear-resistant trash cans to its residents. Each toter size is 95-gallons. Quantities are limited and will be sold on a first-come, first-served basis. Residents will be charge $50 for each can (actual cost is $200) and the amount will be added to water customers’ monthly bill. The city's waste contractor WastePro will not charge residents an additional fee for collection service. The city’s BearWise program is funded through a grant from the FWC to purchase residential, bear-resistant refuse containers to help reduce the potential for human-bear conflicts. The city shared the cost by contributing $5,000 toward the purchase of the bear-resistant trashcans, which allowed for the purchase of a total of 125 bear-resistant trashcans. To request a bear-resistant trash can, please complete this form or call (386)671-8675 . A toter will be delivered to your residence.